Enjoy a meal at the restaurant or snacks in the coffee shop/café. The hotel also offers room service (during limited hours). Meet other guests and eat at the complimentary reception. Quench your thirst with your favorite drink at the bar/lounge. Buffet breakfasts are served on weekdays from 7:30 AM to 10:00 AM and on weekends from 8:00 AM to 11:00 AM for a fee. Make yourself at home in one of the 44 air-conditioned rooms featuring plasma televisions. Complimentary wireless Internet access is available to keep you connected. Private bathrooms with bathtubs or showers feature complimentary toiletries and bathrobes. Conveniences include phones, as well as safes and irons/ironing boards. With a stay at Podol Plaza Hotel in Kiev (Podil), you'll be steps from St. Nicolas Prytyska Church and 4 minutes by foot from Kyiv Municipal Academic Opera and Ballet Theatre for Children and Youth. 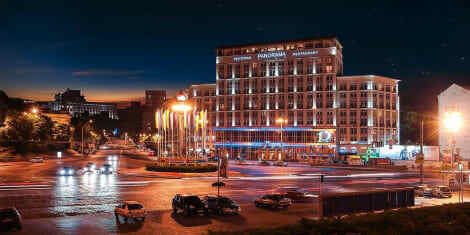 This 4-star hotel is 0.2 mi (0.4 km) from National University Kiev-Mohyla Academy and 0.2 mi (0.4 km) from Kontraktova Square. Make yourself at home in one of the 23 air-conditioned rooms featuring LCD televisions. Complimentary wireless Internet access keeps you connected, and cable programming is available for your entertainment. Bathrooms have complimentary toiletries and hair dryers. Conveniences include phones and desks, and housekeeping is provided daily. Make yourself at home in one of the 134 air-conditioned rooms featuring minibars and LCD televisions. Complimentary wired and wireless Internet access keeps you connected, and satellite programming provides entertainment. Private bathrooms with bathtubs or showers feature complimentary toiletries and hair dryers. Conveniences include laptop-compatible safes and desks, and housekeeping is provided daily. Featured amenities include complimentary wired Internet access, a business center, and express check-in. This hotel has 3 meeting rooms available for events. A roundtrip airport shuttle is provided for a surcharge (available 24 hours), and self parking (subject to charges) is available onsite. Grab a bite at Panorama Club, one of the hotel's 2 restaurants, or stay in and take advantage of the 24-hour room service. Quench your thirst with your favorite drink at the bar/lounge. Buffet breakfasts are available daily from 7 AM to 10 AM for a fee.